Now, I know that spelt is the cheat’s way to wholegrain baking success. It behaves a lot like normal wheat, it being a variety of wheat – despite it popping up, incorrectly, on gluten-free baking blogs from time to time – and is therefore a pretty good in-road for the beginner moving away from plain flour (particularly if you use white spelt – wholemeal spelt is much closer to wholewheat flour so it should be similarly respected and feared when baked with, and used accordingly). I will, however, engage in hand to hand combat with anyone who says that you can just switch white spelt for plain flour ‘one for one’ when baking. The gluten structure is different, its water absorbency/solubility is different and even if (like me) you know little of the science of baking you will appreciate that these things will affect how well it rises and the crumb it will form and other stuff like that. Personally, while I have struggled to make a spelt bread that I am really happy with, I think it does actually gives a softer crumb to things like muffins as the gluten is fragile and breaks down very easily. (In case you’re interested, spelt’s fragile gluten structure is why it is recommended for people with gluten intolerances – rather than true allergies/coeliacs – and people who have trouble, both in reality or in their minds, digesting wheat). So you get your nice soft crumb, but it comes at a price – it won’t rise as well as its plain white all-purpose cousin. But that is part of the thing with wholegrain baking. You have to Realign Your Expectation Curve. You have to choose your battles (as I have said before) and look for recipes where wonderful pillowy rising gluten isn’t the point. Recipes where you can introduce moisture from fruits (banana bread) and/or where flour would ordinarily play a small supporting role (think brownies rather than Victoria sponge). All of that is why THIS recipe works and, not only does it work, it works with (predominantly) wholemeal spelt rather than the refined white stuff. It is really just a take on the ubiquitous ground almond flour cakes that a) cost more than gold to make and b) have become the poster child of the gluten free baking tribe, but with a little wholewheat spelt and even less white flour to lighten it slightly and allow it hold together long enough to get it from the plate to your mouth. It does, of course, have sugar in. It’s a cake. So probably best not eat it in place of your regular three meals a day then. Rhubarb is, as trivia geeks will know, classed as a vegetable and not a fruit (except in the US where it is, by law, considered a fruit. For customs and import reasons at least. True if very boring fact). It is actually a member of the buckwheat family and is thought, when cooked, to contain a number of beneficial properties, notably calcium, vitamin K and lots of fibre. It is in its second season in the UK right now – the ‘forced’ rhubarb season finished roughly a month ago (so those lovely thin vibrant pink stems have disappeared) but we are now into the field grown season until around September, which produces thicker, less tender, greener rhubarb that isn’t as pretty but is actually a lot more tasty. If you are buying it from a greengrocers or farm shop or other suitably middle class purveyor you can try to pick out as many redder stems as you can if pretty is important to you (and, in theory at least, the redder the stem the more beta-carotene it contains), but if you do your shopping online you’ll be stuck, aesthetically, with whatever Keith at Sainsbury’s picks for you and you’ll just have to eat a few more carrots for those beta-carotenes. What you do want though, green or red, is crisp rhubarb that really snaps when you bend it – floppy bendy rhubarb is not your friend. Oh, and the leaves are toxic so don’t feed them to your livestock (or husband). This recipe is a very minor reworking of a gooseberry spelt cake in my new bible, Diana Henry's Change of Appetite. She says it serves 8. Yeah, right. 8 small children who don't like cake, perhaps. I'd say 6, depending how greedy you are. Butter a 20cm (8in) cake tin, preferably springform but removable base alone will be fine provided you grease it well. Add the eggs a little at a time, beating well after each addition until the eggs are incorporated. The mixture might start to curdle but I just leave it as it will come back together once you add the flours. Fold in the flours, the ground almonds and baking powder using a large metal spoon. Plonk the lot into the greased cake tin. Toss the rhubarb in 2-3 tbsp of golden caster sugar, depending on how sharp it is. Spread it over the top of the cake mixture, as in the photo above. 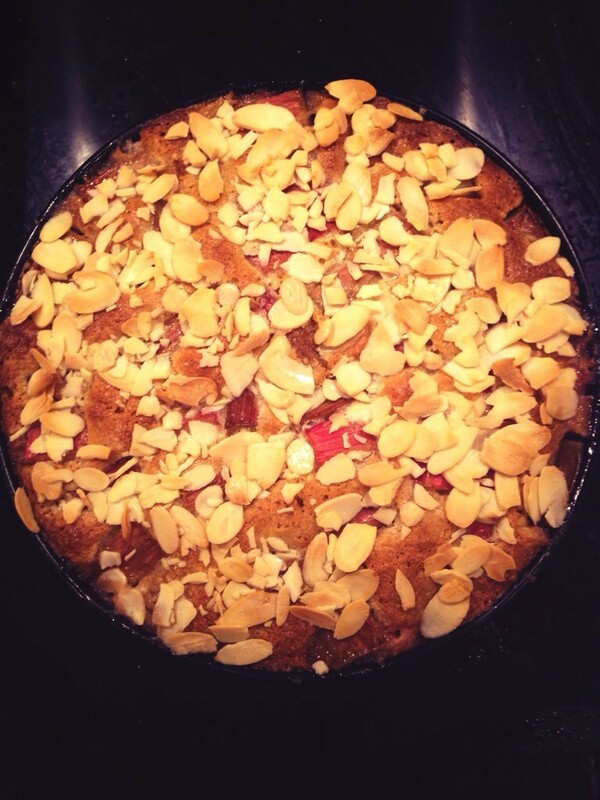 Bake in the oven for 20 minutes and then sprinkle on the flaked almonds and cook for another 8-10 minutes. It is ready when a skewer comes out clean. Leave to cool in the tin before trying to remove - it is quite delicate because of the rhubarb's moisture so leaving it to firm up while cooling is a good idea. Carefully remove once cool. I toyed with the idea of making it with just wholemeal and white spelt but was glad I didn't - I really think it does need that tiny bit (25g) of plain flour to stop the whole thing collapsing in on itself. But feel free to try it with 25g white spelt and prove me wrong. If you are wheat intolerant but can eat spelt I am pretty sure that this would work well with all white spelt flour; I am just unconvinced that it would hold up using all wholemeal spelt flour, or a very large proportion thereof, without a little white flour assistance. The wholemeal spelt can be substituted for regular wholewheat wheat flour. Creaming the butter and sugar: I always do this in my KitchenAid because I am a firm believer in doing this for 5 minutes or more to make it really fluffy and my Kermit-the-Frog-like arms aren't up to the job. But a handheld mixer would be fine provided you aren't easily bored. There is some sifting required, which is quite possibly one of my least favourite kitchen activities. I would recommend it though as you do need all the air you can muster here.